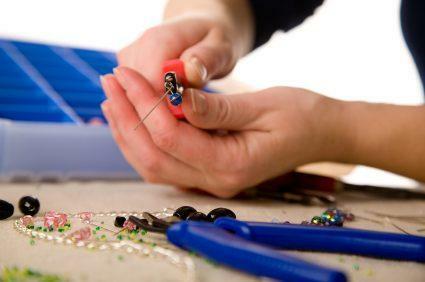 Learn more about beading tools. Whether you need to make a gift for a friend or create a fun accessory for yourself, it's fun to learn how to make beaded anklets. You'll love how fast and easy it is to create your own ankle jewelry. Anklets are bracelets that are worn around the ankle. They are perfect for casual events or warm weather outings, and they look great with bikinis and summer sandals. You can buy anklets at most accessory stores, but making your own is even more fun. Creating your own ankle bracelet is fun and easy. If this is your first beaded jewelry project, you might want to take a look at some of the beading techniques commonly used in this type of craft. These instructions will help you create an anklet that is perfect for any casual occasion. Consider choosing beads that have special meaning for you, such as shell beads from a fun vacation or gemstone beads that are symbolic of your birth month. You can also use letter beads to spell out a name or favorite word. Begin by measuring your ankle. Write down the measurement, and add about four inches. Use the end cutters to cut the beading wire to this length. Put a crimp bead on the beading wire, and string the clasp on behind it. Bend the wire back around, and thread the end back through the crimp bead. Pull the end to secure it, and then use the pliers to crimp the bead. Select the beads you want to use, and string them onto the wire in the order you like. You might want to try laying out your design on a bead board to see what looks best. Stop stringing beads when you have about an inch and a half of wire left. Thread a crimp bead on the end, and then add a jump ring. Tuck the end of the wire back through the crimp bead, and tighten it down. Finally, crimp the bead to secure your work. Add fun charms between the beads. These might be symbols of something you enjoy, letters or initials, or just pretty designs. Charms can add a little extra dangly dimension to your work. Include a few bells in your design. You can find small bells at any craft store, and they are perfect for an ankle bracelet. Every time you take a step, the bells will jingle. Use multiple strands of beads to give your anklet a layered look. This can be fun with several strands of small beads. Make a beaded friendship anklet by using beads and charms that represent you and your friend. Estimate the size of your friend's ankle to get the measurement you need. Whether you choose to make your ankle bracelet a special gift or keep it for yourself, knowing how to make a beaded anklet may really come in handy. This is a fun craft for kids' slumber parties, baby showers, and other group events.